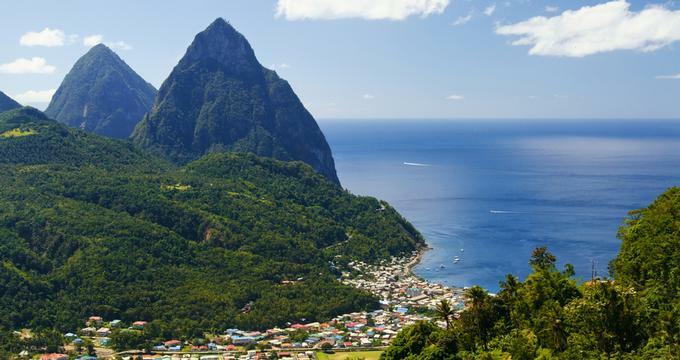 St. Lucia is home to some of the most dramatic and beautiful scenery in the world, with its towering Pitons, white-sand Caribbean beaches and clear blue water surrounding the island. A popular choice for honeymooners, St. Lucia offers a variety of accommodation options, ranging from luxury suites over a cliff and villas on the beach to friendly inns and affordable B&Bs. Situated on a gorgeous, 1,500 foot, white sand beach, St. Lucia’s all-inclusive Windjammer Landing Villa Beach Resort features five pools (including two for children), a luxurious wellness spa, a sweep of thrilling watersports, and fantastic dining. Enjoy a beautiful ocean view guestroom or treat yourself to a stunning, one-bedroom villa with a private sundeck and plunge pool. Spend a day giving it all you’ve got as you try sea kayaking, snorkeling, sailing, scuba diving, and another exploring the island with exciting tours. Indulge in a volcanic mud wrap or a relaxing massage at the chic, tranquil spa. Honeymooners will love the romantic ambiance and spectacular steak and seafood at the resort’s Upper Deck restaurant, while Dragonfly offers splendid, authentic Caribbean cuisine. Grab a delicious barbeque lunch at the beachside Embers. 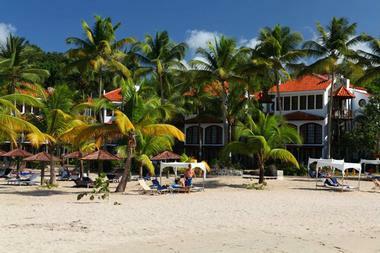 Windjammer Landing Villa Beach Resort is ideal for a romantic getaway or a relaxing family vacation. Ladera, the island’s only resort located on the UNESCO World Heritage Site, overlooks the breathtaking Pitons and the Caribbean Sea and offers a blissful, intimate, secluded getaway and many activities. All 32 suites feature an open, west-facing wall so that you can soak up the astonishing views from your villa. St. Lucia’s nineteenth-century, eco-friendly Fond Doux Plantation & Resort is situated on a 250 year-old tropical plantation and features fifteen uniquely crafted, private, luxury cottages, an organic spa, an array of pools, and two delicious restaurants. 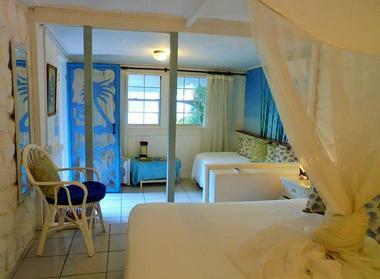 Enjoy a stay in the one- or two-bedroom cottage handcrafted by Caribbean artisans. Couples can indulge in one of the exquisite, romantic, stand-alone honeymoon suites, each complete with a beautiful, private plunge pool. Spend a day pampering yourself at the lush, all-organic Mamma La Terre Spa, or enjoy a fun-filled tour that includes horseback riding and a zipline. Hiking trails, nature tours, and many other island adventures await you. Take in a scrumptious breakfast at The Cocoa Pad Restaurant or an intimate dinner at Jardin Cacao. Both serve fresh, organic St. Lucian and international cuisine, as well as Creole specialties. All-inclusive options are available. 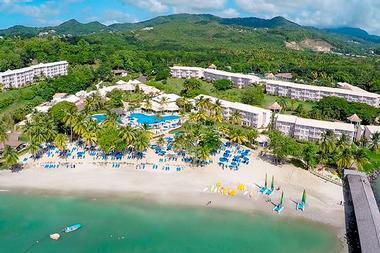 The all-inclusive Coconut Beach Resort & Spa sits on 85 acres and a mile stretch of white sand beaches. It features four restaurants, six bars, five pools, a full-service salon, an oceanfront spa, and the island’s largest water park. Enjoy a luxurious room or romantic suite in the tranquil and posh “adults only” wing or a plush, comfortable room in the fun-filled, kid-friendly wing. Fill your days with unbelievable activities like rainforest cycling, snorkeling, horseback riding, whale and dolphin watching, and ziplining. Take the kids for an action-packed day at the waterpark or at the resort’s paintball court. The list of activities available to you is endless! Catch breakfast at the Coconut Walk Marketplace, then hit the Calabash restaurant for dinner and delight in the fantastic Creole and Caribbean cuisine. La Luna offers more intimate, romantic, oceanfront dining. Stonefield Estate Resort is nestled in the beautiful rainforest and features gorgeous, private, semi-outdoor villas, world-class dining, a full service spa, and a variety of fun-filled activities. Soak up breathtaking views of the Caribbean ocean from your secluded one-, two-, or three-bedroom villa, each complete with air conditioning, an outdoor shower, and a private plunge pool. 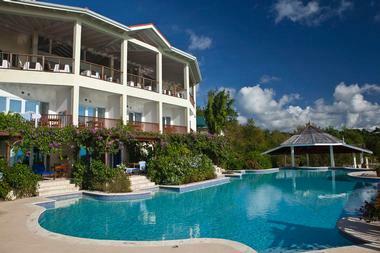 Or bring a group with you to enjoy the stunning, five-bedroom villa. Pamper yourself at the Amais Spa, start your morning with a tranquil rainforest yoga session, or fill your days with rock climbing, a “Soufriere Safari,” canopy tours, ziplining, snorkeling, sport fishing, or dolphin and whale watching, or you can take a water taxi to the Castries. The resort’s Mango Tree Restaurant serves delicious, expertly-prepared regional and international cuisine, with many dishes made from organic produce grown in the onsite garden. All-inclusive options and packages are available. 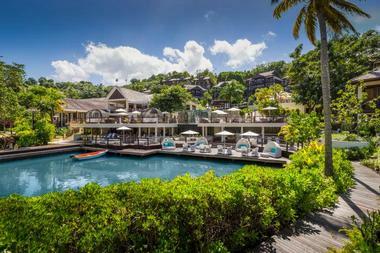 Nestled in a gorgeous, secluded area of St. Lucia that is only accessible by boat, Marigot Beach Club & Dive Resort is a beautiful, 34-room, villa-style resort with fabulous white sand beaches, a pool, a fully equipped dive shop, water sports, an award-winning restaurant and bar, and a fabulous spa and wellness retreat. Stay in a cozy studio, a two-, three-, or five-bedroom family villa or a luxurious, romantic panorama suite. Lounge by the pool, splurge on a scuba dive package and explore the phenomenal marine life of Marigot Bay, find tranquility with a meditation workshop, enjoy a massage, or hike through the rainforest. These are just a few of the many activities available to you here. Their award-winning Doolittle’s Restaurant & Bar serves up delicious international and regional cuisine, and meal plans are available. The Landings St. Lucia is an exquisite resort with its own private yacht marina, a humongous signature spa, three restaurants, two bars, three pools, water sports, butler services, grocery stocking services, and more. It features 85 spacious one-, two-, and three-bedroom designer villa suites. Luxurious beachfront villas are also available. Soak up some poolside sun or go scuba diving while the little ones enjoy arts, crafts, and outdoor activities at the resort’s Kids’ Club. After kayaking, paddleboarding, sailing, and hiking, pamper yourself with massages, facials, and body scrubs at the 7,000 square-foot Soleil Spa. Enjoy fantastic Caribbean-themed cuisine at The Beach Club restaurant, located on the water’s edge. Alternatively, you can try the seasonally changing menu at The Palms – a more intimate-themed eatery. Refreshing cocktails are always available at either the Viscount Lounge or The Turquoise Beach Bar. La Haut Resort boasts astonishing views of the world famous Piton Mountains, two swimming pools, and fantastic dining, and it also offers a whole host of fun-filled activities. The property houses 17 units to accommodate you and your guests, including rooms, suites, and private villas and cottages (for groups of four or more). Each has a small kitchenette and a balcony with a view you won’t forget. Tour a plantation, the Soufriere volcano, or the lush, tropical rainforest before catching a blissful sunset cruise. Spend the next day riding horseback, rainforest cycling, snorkeling, sailing, or taking a rainforest canopy adventure. Enjoy breathtaking views from the spectacular Delice Restaurant and Bar, which serves up fantastic, expertly prepared, and authentic Creole and international cuisine, all made from locally-sourced ingredients. All-inclusive options and meal plans are available. 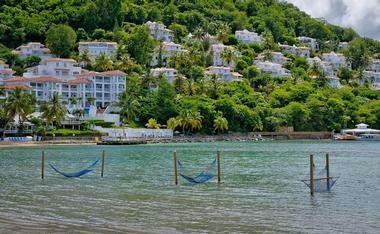 Bay Gardens Inn, a cozy, intimate hotel in St. Lucia’s famed Rodney Bay just a stone’s throw away from Reduit Beach, boasts a gorgeous, sparkling pool, and incredible dining. Each of the 33 rooms has their own private terrace. Choose from a standard, superior, or deluxe suite. A complimentary shuttle will take you to the inn’s sister properties, Bay Gardens Beach Resort & Spa and Bay Garden Hotel, for all the activities you can imagine. The kids can enjoy the Splash Island water park while you try your hand at water skiing and other wake sports, hike through the jungle, or indulge in a tropical shopping excursion. Creole Pot Restaurant serves incredible, passionately prepared, authentic Caribbean and international cuisine, while the Ti Ponche Bar has just the right concoction to quench your thirst. All-inclusive plans and packages are also available. Class, elegance, luxury, and fun are the themes of Capella Marigot Bay Resort, which boasts an exclusive, 40-slip marina, two infinity plunge pools, a gorgeous organic spa, and stunning views of the Caribbean’s most beautiful bay. The resort features 124 rooms and suites, some of which include kitchens, balconies, and astonishing vistas. Splurge on the fabulous, plush penthouse suites for the ultimate experience. Kids can enjoy a guided nature hike and cooking classes, while there are a host of adult activities like watersports, deep sea fishing, volcano tour, cooking classes, horseback riding, ziplining, shopping at Marina Village, or rum tasting. Take advantage of the complimentary babysitting service, while you charter a yacht for a private, romantic, sunset cruise. Savor incredible Caribbean and international cuisine at Capella’s Bayside Café or devour fresh seafood at The Grill at 14°61°. 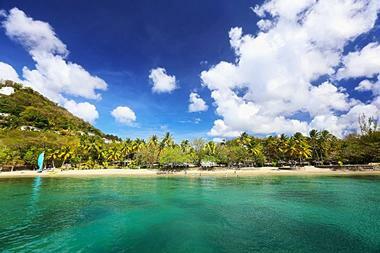 Whether it’s a family vacation or a romantic getaway, Capella Marigot Bay Resort has something phenomenal for all. Built by architect owner Nick Troubetzkey, Jade Mountain Resort features a luxurious boutique spa and fitness studio, unbelievable private infinity pools, and the best and most iconic views of both the Piti and Gros Piton mountains, which rise majestically above the Caribbean. There are 24 spectacular villas, each with its own infinity pool and one wall open to a breathtaking vista. Five other villas feature a hot tub, but no private pool. After an action-packed day of rainforest hiking, volcano exploring, and snorkeling, indulge in a relaxing massage or a signature chocolate ritual at Kai en Ciel spa. 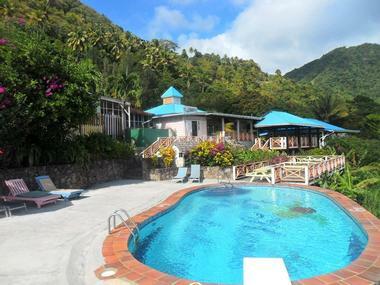 You also have access to all of the amenities, activities, and dining offered at the sister resort, Anse Chastanet. The Celestial Terrace is perfect for cocktail sipping and romantic stargazing. 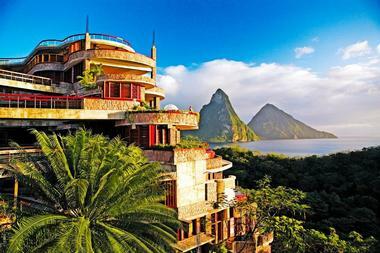 The exquisite Jade Mountain Club serves amazing modern fusion cuisine and spotlights occasional live entertainment. 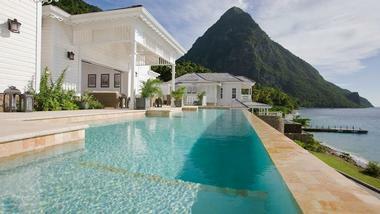 The naturally elegant Jade Mountain Resort is a peaceful paradise. St. Lucia’s extravagant Calabash Cove Resort & Spa features a stunning infinity pool that overlooks the gorgeous Caribbean Ocean, a state-of-the-art fitness center, a tranquil music room, and a luxurious spa. With 25 units, you can choose from a suite with an ocean view, a swim up suite that opens up into the main infinity pool, or splurge on a private cottage that includes a secluded plunge pool, jacuzzi, outdoor rain shower, hammocks, and tranquil seclusion. Soak up the sun by the beautiful pool and sip on a refreshing cocktail from the swim-up pool bar. Pamper yourself at Ti Spa with incredible massages, scrubs, facials, body wraps, and salon services. Enjoy the nightlife at C-Bar, which boasts stunning ocean views. The Windsong Restaurant serves fantastic international cuisine and local fare with Asian influences. Accessible only by ferry, St. Lucia’s charming, cozy Mango Beach Inn is a beautiful, old stone building surrounded by lush rainforest. It’s the perfect location for adventurous spirits. Lovebirds will enjoy the Blue Bamboo Cottage, while others will love the spacious Green Fig Suite and all other rooms in this guesthouse. 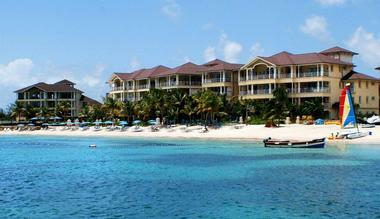 Your stay includes a complimentary Caribbean breakfast (with fresh fruit grown onsite) and a free ferry pass. Two hiking trails start in the inn’s garden. One leads to a meditation platform that overlooks the island’s highest peak, Mount Gimie. An established jazz venue, the Rainforest Hideaway restaurant serves delicious international cuisine and regional eats. 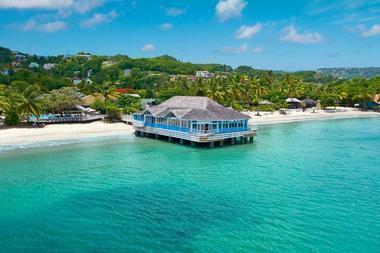 It is built on the Mango Beach Dock and serves as the perfect spot for a romantic night. Snorkeling, scuba diving, shopping, horseback riding, sailing, and an endless list of fun activities are just minutes away by foot, ferry, or water taxi. 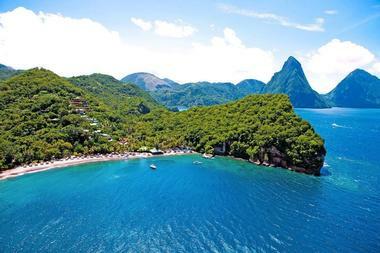 St. Lucia’s breathtaking, 100-acre Sugar Beach, a Viceroy Resort boasts unbelievable views of the Pitons and Caribbean Ocean, gorgeous waterfront dining, a luxurious, world-class spa, full PADI dive facility, and swanky bars and lounges. Select a beautiful guestroom with a private plunge pool and walled garden or splurge on a spectacular, secluded bungalow with a private courtyard, outdoor shower, jacuzzi, pool, and sun lounge. After a day of ziplining through the rainforest and snorkeling with dolphins, indulge in pampering spa treatments in a fantastic, tree house treatment room. Kids will enjoy the Sugar Club activities like arts and crafts and treasure hunts. Savor a delicious, candlelit dinner comprised of amazing Caribbean-influenced eats and international cuisine at the Great Room restaurant before heading over to the chic Cane Bar to sample some of the best rums in the world. All-inclusive options and plans are available. St. Lucia’s dreamy and beautiful East Winds Inn, the perfect location for a lovers’ getaway, peaceful retreat, or relaxing holiday, is situated on the island’s finest beach with 30 stunning cottage-style suites, an open-air spa pavilion, fantastic oceanfront dining, and nightly entertainment. Enjoy a plush, spacious cottage with a private terrace or indulge in an extravagant ocean view suite. Have fun hiking, snorkeling, and learning how to sail before ending your day with a romantic sunset cruise. Pamper yourself with traditional Caribbean wellness treatments at the chic, tranquil spa and then join your friends for rum tasting. The Flamboyant Room, East Winds’ oceanfront restaurant, offers breathtaking views and exquisitely prepared and intimate candlelit dinners. Enjoy cocktails from the inn’s bars to unwind from all your adventures. All-inclusive options are available. The all-inclusive Sandals Grande St. Lucia Spa & Beach Resort sits on one mile of beautiful beach on a secluded peninsula and features panoramic views, exciting nightly entertainment, incredible eats, unlimited scuba diving and watersports, a swim-up lagoon village, five pools, and more. Get comfy in the gorgeous guestrooms or treat yourself to a romantic, beachfront “Love Nest” suite complete with a private plunge pool and patio, hammock, whirlpool, outdoor shower, and stunning views. Explore the natural beauty of the Caribbean Ocean with world-class scuba diving and snorkeling opportunities. Pamper yourself with a sensual couple's treatment at the Red Lane Spa. Enjoy access to a nearby nine-hole golf course, as well as all activities and dining at two other Sandals resorts on St. Lucia. With nine dining options and six bars, every night will be different. Seafood lovers won’t want to miss the exotic Gordon’s restaurant, while Kimono’s serves up incredible Asian fusion cuisine. 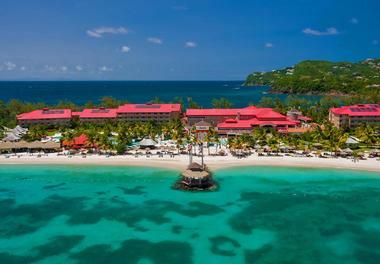 St. James’s Club Morgan Bay is a stunning, all-inclusive resort set on a gorgeous white sand beach on St. Lucia’s sparkling Choc Bay with four pools, exciting nightly entertainment, an array of water sports and other adventurous activities, and a spa and salon. With 335 rooms on the property, simply decide if you want to wake up to a view of the ocean, the pool, or the garden. Start your day off with a bang at the Caribbean dance class before going banana boating. Kids will love the supervised Kids’ Club, while parents can relax in the peaceful spa. With six restaurants at the resort, you can try the French Creole at Le Jardin restaurant one night and savor delicious, fresh seafood at -the romantic Morgan’s Pier Restaurant the next. Enjoy lovely evening cocktails at the Sunset Bar & Lounge. Situated on 600 lush, tropical acres complete with two sand beaches, the luxurious Anse Chastanet Resort is St. Lucia’s only resort property with iconic views of both the world famous Piti and Gros Piton mountains over the Caribbean Ocean. 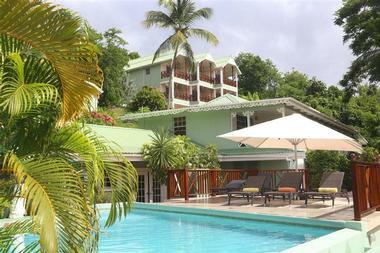 With 49 individually designed rooms, choose from beach level tropical garden suites or others nestled in the hillside. Jade Mountain is a resort within the resort, offering spacious suites, each with its own private, extravagant infinity pool overlooking the mountains and ocean. After a day filled with snorkeling, jungle biking, and hiking, indulge in one of the spa’s signature rituals. There is also a weekly “Jazzy Champagne Sunset Cruise.” Enjoy a romantic, candlelit dinner at the award-winning Treehouse Restaurant, which serves tropical world cuisine. Or try one of the other onsite restaurants, like the all-vegetarian Emeralds. St. Lucia’s premiere, all-inclusive The BodyHoliday fitness and spa resort sits in a secluded cove on the unique Cariblue Beach and features a world-class wellness center, a tennis and golf academy, numerous healthy dining options, and a variety of physical activities for active, adventurous guests like you. You will love the luxurious guestrooms of various sizes that offer views of either the ocean or the resort’s impeccable tropical garden. Try your hand at archery, fencing, or any number of the resort’s exciting watersports. Fitness junkies and weekend warriors will love the adventure program, which offers thrilling activities like waterfall rappelling and abseiling 120 feet into a lush river gorge. Your stay includes a daily spa treatment, and you won’t want to miss the spa’s “Wellness Journey” treatments. Enjoy fabulous dinner of Eastern-Western fusion cuisine at TAO restaurant and then slide into The Piano Bar for the lively nightly entertainment. 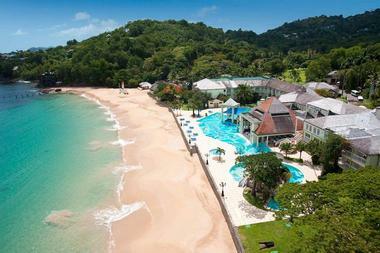 St. Lucia’s glamorous Sandals Regency La Toc Golf Resort and Spa is a 210-acre estate situated on a gorgeous crescent-shaped beach and features three pools (including the island’s largest), scintillating dining, a stunning nine-hole golf course, and a fabulous spa. Take a deep breath of fresh ocean air as you step out of your plush room onto a private balcony. Sunset Bluff Village, a resort within the resort, boasts breathtaking views from its perch atop the property’s bluffs and offers secluded villas with sparkling private pools. After a lovely day on the majestic fairways, indulge in a luxurious spa treatment before hitting the resort’s casino night. Tantalize your taste buds with delicious classic French cuisine at the elegant La toc restaurant or savor delicious, fresh seafood Mediterranean-style at Neptune’s. All-inclusive options and plans are available. Rendezvous Resort is a fabulous, all-inclusive, boutique hotel exclusively for couples that sits on the white sands of Malabar Beach and features candlelit dining on the beach, a world-class spa, three pools (including a lazy river that meanders through the resort), and an endless list of adventurous activities. 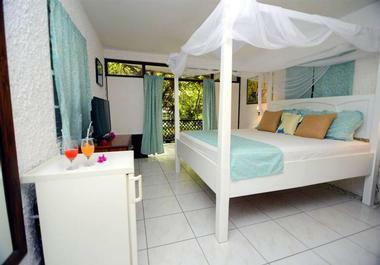 Relax in one of Rendezvous’ plush, ocean view rooms, suites, or a luxurious beachfront cottage (with a private patio). Fill your days with scuba diving, sailing, wakeboarding, bike tours, snorkeling, and archery, or lounge by the pool and get a sensual couple's massage at the exquisite spa. Golfers can perfect their swing at the weekly golf clinic, then visit a nearby golf course to practice. Dinner at the spectacular beachfront Malabar Beach Club promises an unforgettably romantic night. Head over to The Champagne Bar for fun, live entertainment and socializing. Ti Kaye Resort & Spa is located cliffside of the secluded Anse Cochon cove and features a beautiful pool, exquisite dining, a premiere spa, a fitness center, and a plethora of outdoor activities and adventures. Thirty-three cottages are nestled along the hillside featuring private outdoor showers and large balconies, each with a double hammock. Splurge on an oceanfront cottage with a private pool and sun deck. Ride horseback across the gorgeous beach and go on a rainforest canopy adventure tour one day, and try scuba diving the next. Pamper yourself at the luxurious Kai Koko Spa, built around breathtaking ocean vistas. Stroll over to the beachfront Ti Manje Restaurant & Bar for authentic Creole cuisine and a refreshing cocktail. Enjoy a fabulous dinner at Kai Manje Restaurant & Bar, where they also have an underground wine cellar. Inspired by nature, Ti Kaye Resort & Spa is the perfect place to escape. Sandals Halcyon Beach Resort & Spa is built naturally into the environment along its fantastic white sand beach and features two pools, a luxurious spa, six incredible dining options, an endless list of thrilling outdoor activities, and exciting nightly entertainment. While the standard rooms exude beach house charm (some with private balconies and large tubs), there are also extravagant honeymoon suites and beachfront suites with large private patios. Start your vacation off with relaxation by diving into a restorative and blissful spa treatment at the Red Lane Spa. Then jump into an action-packed day of snorkeling, windsurfing, beach volleyball, rainforest tours, and more. Guests also have access to all amenities and activities at two other nearby Sandals resorts, including a majestic nine-hole golf course. Savor scintillating, fresh seafood at Kelly’s Dockside Bar & Grill or enjoy scrumptious Asian fusion cuisine at Soy Sushi Bar. 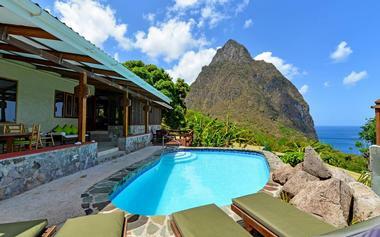 Nestled in St. Lucia’s gorgeous Soufriere, the quaint, cozy Hummingbird Beach Resort features breathtaking vistas, a sparkling pool, occasional live entertainment, a delicious restaurant, and a beachfront bar. There are just nine stunningly decorated rooms and suites (some with a private balcony and air conditioning), as well as an amazing, secluded country cottage that offers peaceful privacy and awe-inspiring views of the Caribbean and the Pitons. Soak up some sun by the pool, lounge in the warm sand, or take a dip in the ocean. You can also explore the island outside of the resort through nature hikes, ziplining, ATV rides, historical and cultural tours, and more. Indulge in passionately-prepared Creole and a la carte French cuisine and exquisite wine pairings at the Lifeline Bar and Restaurant. Thirsty beachgoers can also visit the beach bar. For a more personal and intimate tropical getaway experience, you will want to stay at Hummingbird Beach Resort. The elegant, upscale Royal by Rex Resorts offers luxury suite accommodations, gorgeous views of the Caribbean, award-winning restaurants, a premiere spa, a sparkling pool, and tranquil privacy. The property’s 94 suites of various sizes boast marvelous views of the resort’s garden, pool, or the beautiful sea. Honeymooners will enjoy the secluded, spacious perches overlooking the beach and ocean. You will feel a certain sense of magic as you ride horseback across St. Lucia’s fantastic landscapes. Try your hand at sailing, waterskiing, or scuba diving. Soak up nutrients in a luxurious spa treatment using plant- and marine-based ingredients. With five extraordinary dining options to choose from, savor incredible Creole and international cuisine at L’Epicure & Terrace one night and the next, light fare served over fun live entertainment at Le Mistral Lounge. There will be enough time to try a little of everything.